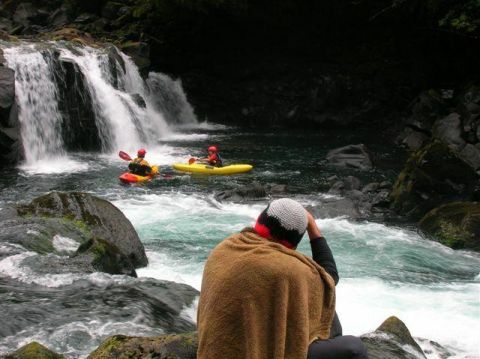 The River Fuy near Neltume, Chile – 2-1/2 hours from Pucon is normally broken up into three sections: Upper , Middle and Lower. The upper in lower to mid flows is a classic class 4+ section filled with beautiful waterfalls. The put in for this section is at the exit of Lago Pirihueco and the takeout is just above and beside the town of Neltume. Ideal flows would be 400 to 1200 CFS and most likely would be in December and January. The middle is section is class 5 with a 50′ waterfall. The put in is at the base of the still un-run Salto Puma which lies 700 meter below the road entrance to the tourist attraction Salto Huilo Huilo. This 4 KM section is short but intense and best run in the dryer months of February and March. The put in involves a 2 KM walk from the road which is not easy to locate. the 2 KM walk to put in starts 700 meters below the feeder road to Huilo Huilo at a black wooden fence (this is also 2.3 KM above the small puente Llallanca). Leave your vehicle here and scramble down to the base of Salto Puma. Take out is at bridge 4.7 KM downriver. The lower section is a 4 KM long mostly class 3 wave train best run at extremely hi water (greater than 2500 CFS) when the top and middle are unrunnable.. This would like be winter months and spring flows from September to late November..It can be run much lower it just will not have much kick. the put in and takeout are both at the only road bridges that cross the Fuy. Unfortunately there is a damn project in the works and this river may be dry.